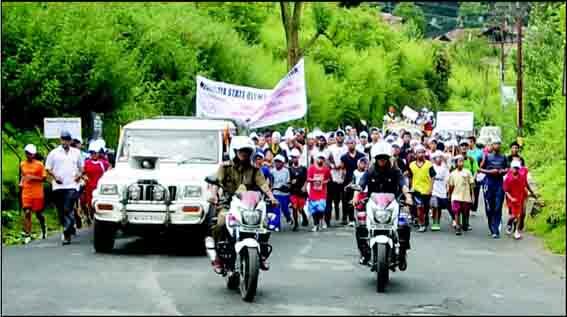 Shillong: Around 500 people participated in the Olympic Day run, organised by the Meghalaya State Olympic Association (MSOA) in collaboration with the Directorate of Sports and Youth Affairs, on Saturday morning to commemorate the creation of the International Olympic Committee in France in 1894. The run was flagged off by Deputy Chief Minister and Sport and Youth Affairs Minister, BM Lanong. People of all ages and different sections of society, including sportspersons, participated in the run which started from Madan Iewrynghep and culminated in the JN Stadium Polo. On this occasion, Lanong, while mentioning about the spirit of the participants, said that sports is alive because of the love of it shown by these enthusiastic youth and urged them to keep the good work going. “This run is not a mere run but it is a mark of observing the Olympic Day”, said Lanong while adding that there was a huge difference in the number of participants as compared to last year which depicts the rise of interest for sports activities among the people of the State. Lanong also took the opportunity to inform that the government is working to find means of laying the artificial turf at JN Stadium to cater to the needs of the football players of the State, especially the young talents.